Call 320-241-1841 Sire is a registered purebred light Golden Retriever, he is half English cream and very light in color. 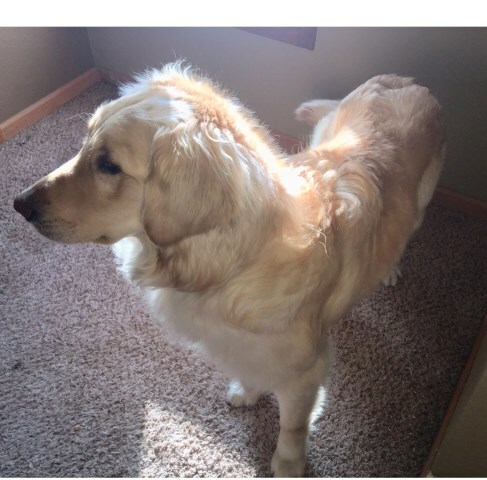 Our Dam is a registered purebred light Golden Retriever, also half English cream but more medium in color. She is also a certified service animal and from the litter of a UKC champion sire! Our puppies are raised in our family home with several children along with cats and other farm animals and will therefore be well socialized. They will have shots and be veterinarian checked prior to being adopted by you! Puppies will go home with a collar and blanket with mom and litter mates scent. To set up a time to meet or if you have more questions and/or to request more photos please call, text, or email! We look forward to hearing from you! The Sire is not for sale but pictured at the bottom.